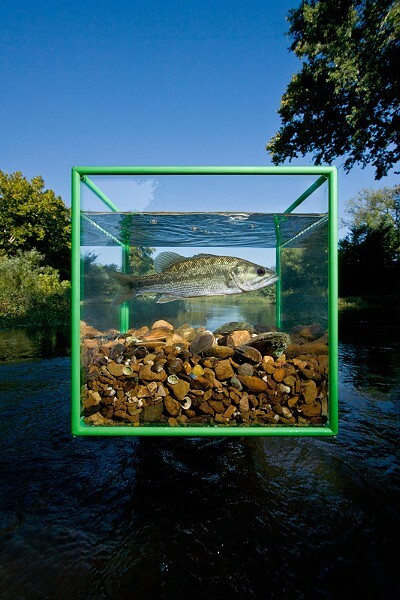 PHOTO PROVIDED David Liittschwager's "One Cubic Foot" project set up in Duck River, Tennessee. The project is in Rochester this month, focusing on the Genesee River. You might consider knowledge of the range of species in a rainforest or a coral reef to be privileged, reserved for scientists and others who study such things. But truth be told, most of us are only vaguely conscious of the minute, diverse scope of life that exists all around us, as we buzz through our daily hustle. Through his "One Cubic Foot" project, photographer David Liittschwager spotlights biodiversity in exotic locations and our backyard alike, teaching us why it's worth looking. This week, he brings the project to the Seneca Park Zoo. One Cubic Foot began as a magazine piece for National Geographic. "The original idea was to explore how much life you could find in a small place, and to figure out how to show what that small place is," Liittschwager says. He bought a metal cube frame, set it down, and documented every species that dwelt within or passed through that small, fragile world. A photographer of biological surveys, Liittschwager has spent decades documenting wildlife, with an emphasis on endangered species. For the past decade, Liittschwager has plopped down his little green frame in leaf litter in New York City, in a shrubland in South Africa, a cloud forest in Costa Rica, a coral reef at the French Polynesian Island of Moorea, Duck River in Tennessee, and a couple of areas in the San Francisco Bay, among other locations. Each time, he's identified and made portraits of hundreds or thousands of plants and animals, from moss and mites to mammals. He sticks mainly to species you can observe with the naked eye, ranging from a couple of millimeters to a raccoon. Documentation techniques include observation, photography, and a full-on excavation of the site, if it won't be harmful to the environment. "Sometimes it's not appropriate to be digging holes," Liittschwager says. "We can cube in a national park, but you wouldn't want to get a shovel out." He says he chooses spots where the environment will recover quickly, and always puts things back in place when he's finished. Liittschwager has received letters from people conveying their surprise about the variety and amount of life found in such a small spot. Other people, including school groups, are beginning to replicate the project, which he encourages. You can learn how to create your own One Cubic Foot study at The Smithsonian's "Curious" website. Seneca Park Zoo has teamed up with One Cubic Foot, inviting Liittschwager to place the frame and equipment by a pedestrian walkway at Turning Point Park. Liittschwager and his team, as well as members from the Smithsonian Institute, plan to work in the Genesee River August 12 through August 16. And on Thursday, August 20, at 6 p.m., Liittschwager will give a lecture at the George Eastman House (900 East Avenue). Zoo staff members see this project as having good potential to engage locals with their environment, encouraging vigilance specifically about the recovering Genesee River and Great Lakes biome. Under the Great Lakes Water Quality Agreement of 1987, Canada and the United States identified 43 "Areas of Concern" — which includes the Genesee River and Lake Ontario — with histories of industry and elevated pollution. A remedial action plan was penned, and a committee organized, which includes veterinarian and Seneca Park Zoo Director of Wildlife Health & Conservation, Jeff Wyatt, who has worked specifically on the ongoing efforts to reintroduce river sturgeon and river otters in the Genesee as sentinel species, used to measure the recovery of the river. Though the industrial impact of companies such as Kodak and RG&E has waned, Wyatt says our river and lakes are still contaminated with "legacy pollutants" such as mercury, PCBs, and dioxins, which don't biodegrade. There are enduring pollutants, such as phosphorus from agricultural runoff, as well as emerging concerns with birth control, pharmaceuticals, and other chemicals making their way into our waterways. And there's still the issue of people misusing the storm drains, which are meant only for rain. Executive director of the Seneca Park Zoo Society Pamela Reed Sanchez says that challenges in engaging the public in conservation often involve the public's own sense of its ability to affect change. "Sometimes the problem seems so big that one person's individual's actions can't make a difference," she says. But if our collective actions can harm, our collective actions can help. Part of the zoo's mission is in educating people about the interconnectedness of human action and animals in the complex web of life, and "getting them to understand that their actions locally can make a difference globally for species survival." Constantly acquiring the newest electronics, for example, ruins habitats through strip mining for metals in Africa. And American consumption is absolutely inundated with manufactured products containing palm oil (sometimes listed under one of its hundreds of aliases), the unsustainable cultivation of which contributes to the decimation of orangutan's habitats. Disrupting our own destructive tendencies is going to take education and focused effort, and direct engagement with the ecosystem, beginning at home. "We don't take the time right now as families to go out on nature walks and reconnect the way we did 30 years ago," Sanchez says. The zoo encourages what they call "citizen science," opportunities to help monitor the environment by going out on frog watches, bird counts, and bat-listenings, or participating in "Pulling Together," a program for identifying and removing invasive species.